Western New York has been home to a number of great Polish and Polish American artists. Alice Wadowski-Bak, Ben Rozek, and Joseph C. Mazur were all born in the region while Marion Rzeznik, Kazimierz Chodzinski, and Eugene M. Dyczkowski would make it their home. Of those who settled in the Niagara Frontier only one worked in the ancient art of sgraffito, Professor Joseph Slawinski. School of Decorative Arts in Warsaw, an internship with Wladyslaw Drapiewski, and culminate with graduation from the Academy of Fine Arts in Warsaw. It was during his studies, that Slawinski first visited Italy and discovered sgraffito. Sgraffito, an artistic process where pigmented cement is layered and before it fully dries is cut away to expose the color the artist desires, has been used since pre-Roman times. Joseph would work with the medium over the next 30 years, during which time he fought in the Warsaw Uprising, survived the war, became a professor at the Fine Arts Academy in Warsaw, and began restoring art objects damaged in the war. By the early 1960s Slawinski wanted to move to America. While looking for a place to settle, Father Ignatius Olszewski of the Pallottine Fathers in North Tonawanda recommended Western New York. Encouraged by Cardinal Wyszynski to work in Polonia and an offer of work by Msgr. Bogacki for Assumption parish in Black Rock, Joseph moved to Buffalo in 1963. 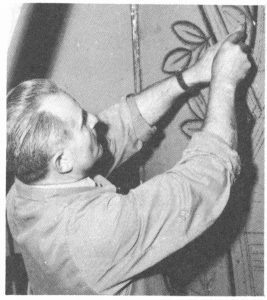 For his first project in the United States, Slawinski was commissioned to decorate the sanctuary of Assumption. When completed, the five paneled sgraffito, Scenes from the Life of the Blessed Virgin, went through Polonia and the art community like a shockwave. Soon Joseph was creating sgraffito for the Chapel of the Sacred Heart, Kennedy Peace Memorial, and St. Francis Chapel, all at Stella Niagara and with the help of Michal Baranowski. Other religious works by Slawinski include the Peace Mural at Basilica of the National Shrine of Our Lady of Fatima, a Monte Cassino memorial for St. Stanislaus Church in Buffalo that was blessed by St. John Paul the Great in 1969, St. Joseph Calasanctius for the Piarist Fathers, and a hammered copper portrait of Pope John Paul II presented to the pontiff in 1980. Slawinski also received a number of public commissions. For the City of Buffalo, Joseph created a hammered copper Seal of the City and a memorial of the Katyn Massacre for City Hall. Erie County hired him for a three paneled sgraffito of Buffalo’s Polonia for the Erie County Medical Center and West Hertel Middle School contracted Slawinski for a sgraffito of Commodore Perry at Black Rock. To stay close to the Polish American community, Slawinski maintained a studio at 1244 Fillmore before moving it to Buffalo Avenue in Niagara Falls in 1973. This studio would be his home until his passing in 1983. The importance Slawinski’s work to Buffalo’s Polonia is best exemplified by the preservation effort surrounding the Calasanctius mural. When the Frank Lloyd Wright designed Graycliff Estate was being restored, it became necessary for the St. Joseph Calasanctius sgraffito that was added to the site in the 1960s to be removed. 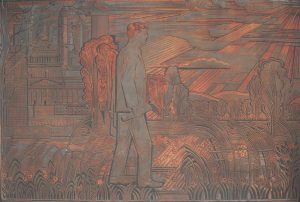 In a project that cost over $200,000, the mural was restored and relocated to the Buffalo State College campus in 2005. The Art of St. Francis of Assisi Friary at St Francis High School. Athol Springs, NY: St Francis High School, 1995. Print. "Chopin Singing Society Fetes Senator Kennedy." Am-Pol Eagle [Cheektowaga, NY] 25 Jan. 1968: 17. Print. Dojka, Jean. "Dr. Slawinski Meets Pope John Paul II at the Vatican." Am-Pol Eagle[Cheektowaga, NY] 20 Nov. 1980: 20. Print. Garner, Anne. "Jozef Slawinski - A Polish Artist on the Niagara Frontier." Polish Arts Club Monthly Bulletin (Dec. 1994): 3-5. Print. Gessner, Peter K. Unveiling of the Relocated and Restored Calasanctius Mural by Jozef Slawinski. Buffalo, NY: Polish Arts of Buffalo, 2005. Print. Nowicki, Waclaw. "Interview With Professor Joseph Slawinski." Am-Pol Eagle [Cheektowaga, NY] 12 Apr. 1979: 3. Print. "Professor Joseph Slawinski." Am-Pol Eagle [Cheektowaga, NY] 7 Jan. 1971, Citizens of the Year sec. : 8-9. Print. "Professor Slawinski Opens Art Gallery and Studio." Am-Pol Eagle [Cheektowaga, NY] 28 June 1973: 4. Print. "Sgrafitto Artist Returns to Area." Buffalo Courier-Express [Buffalo, NY] 9 July 1965: 31. Print. Smith, H. Katherine. "Polish Artist Explains His Technique In Rare Mural Medium of Sgrafitto. "Buffalo Courier-Express [Buffalo, NY] 11 June 1967: 19. Print. Szemraj, Edward R. "The Life and Career of Artist Joseph Slawinski." Am-Pol Eagle [Cheektowaga, NY] 20 Apr. 2000: 23. Print. Szemraj, Edward R. "The Life and Career of Artist Joseph Slawinski." Am-Pol Eagle [Cheektowaga, NY] 27 Apr. 2000: 12. Print. Szemraj, Edward R. "The Life and Career of Artist Joseph Slawinski." Am-Pol Eagle [Cheektowaga, NY] 4 May 2000: 10. Print. The Renovation of the Chapel at Stella Niagara, New York. Stella Niagara, NY: Sisters of Saint Francis of Penance and Christian Charity, 1964. Print.